Beat the Post Holiday Blues, Go Pink! There’s always that “blue” feeling when we take down the last of the Christmas lights, toss out the few uneaten cookies (well, we can’t eat them or we’ll ruin our New Years Resolution to lose those pesky pounds:-)and find homes for all of those goodies we got from Santa. Now what? Winter looms dark and dreary and it only just got started a couple of weeks ago! What better way to perk up and get inspired than to think on warm, lovely, mushy, Valentine’s Day crafts! Heck the stores had Valentines in them before the New Year showed up! Prickley Pear Rubber Stamps to the rescue! As I mentioned in an earlier post, I recently found out that I made it onto the Prickley Pear Design Team (see the link on the left) and our first challenge arrived in the mail a couple of days ago. Kids are back at school, so I got to sit down and play with some new stuff! This is my Gilded Heart with Wings book, that I will be sending off to PPRS tomorrow. 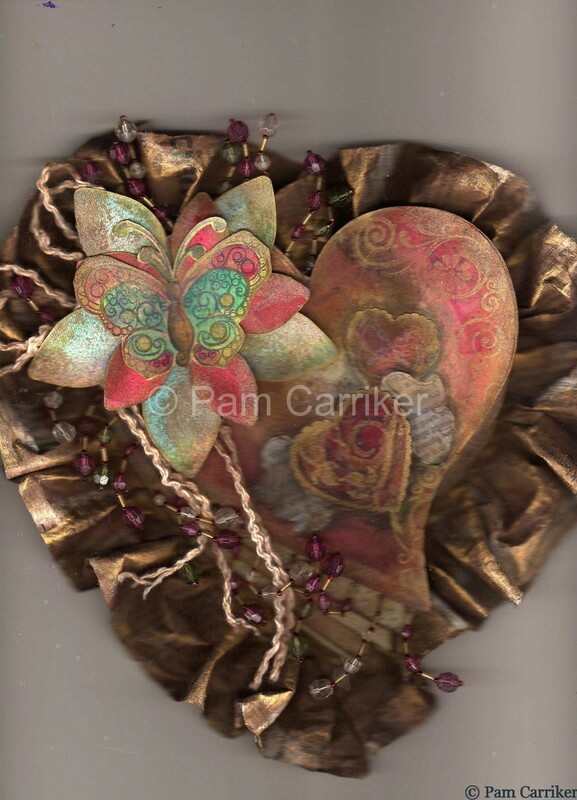 I just love vintage, over elegant, victorian feeling, valentines. It’s the time of year to go over the top, add some extra lace, glitter and romance to your work. It stirs the woman in you! Have I mentioned how GORGEOUS this is? Holy moly. I am in awe of your altering abilities! !